Field Event Facilities: Full - 1 HJ, 2 PV (1L-CE), 4 LJ, 4 TJ (2L-ALT, 1L-DE), 1 SP, 1 DT/HT (INT), 2 JT (1 INT, 1 EXT). There are also some disused DT/HT circles. 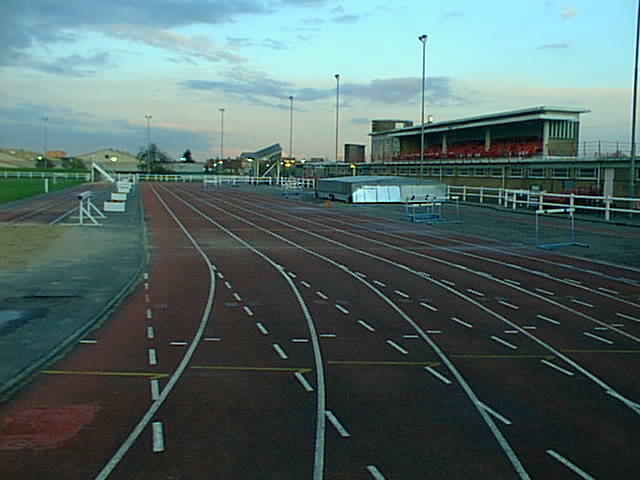 The track was originally cinder and was upgraded to a synthetic track in 1979 with 8 lanes all round. It was resurfaced with Polyflex 942 by Recreational Services Ltd. in July 1990. The infield is slightly raised from the track surface around the majority of the track. The clubhouse near the finish was totally gutted in an arson attack in 2000 but the stand is OK. In order to try and achieve a full track certification, the main DT/HT cage was moved by the start of the 2001 season to the centre of the top bend D rather than in the far corner. The cage near the 1500m start was removed. This means that JT is now only possible from the first bend D. Apparently the track closed on H&S reasons from 2008-2011 but was rebuilt as a 6 lane all round track in 2010. See also this article about Enfield FC moving into the stadium in 2011.